The 2.25 pm start is ridiculous. Apparently it is an experiment, something to do with increasing turnover, but it must be all off-course money as there is hardly anyone here. They’re all at the beach having a long weekend. 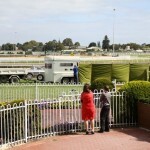 I’m not overly fussed as I am concentrating on photography and not too worried about the betting. I managed a decent shot of “elbow”, which is a new variable. This is when the strapper employs her right-hand elbow to apply some pressure to the horse’s neck or shoulder, usually holding on to the leading strap with the same hand. 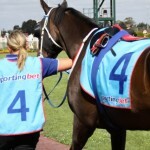 It is often just a precursor to more effort being used to control the horse and the strapper is forced to use two hands. Two hands is already one of my favourite negative variables. A bit of a panic went around the course when the green screen went up around a hobbling Romancingthestone, just after the finishing post. Fortunately the horse ambulance turned up and the horse managed to be loaded. Here’s hoping the filly can survive. A bet on the striking grey Chase The Rainbow in the sixth. I hardly ever back Rick Hore-Lacy’s horses as they are often over-aroused. At his first start on Boxing Day Chase The Rainbow was all over the shop, fractious, rearing up, and sporting bar plates. He finished tailed off last. Today he has the concussion plates, much more forgiving, and is prancing. I’m forgiving too and he grabs third at $1.70 in a blanket finish. 5.30 pm. Time to go home. I miss the last two races. What is the club thinking? 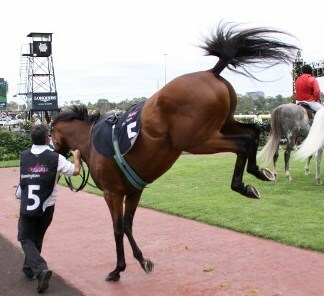 One of my rules of betting is that horses must keep four feet on the ground, but clearly they don’t always listen. Obviously strong willed horses that are bucking their brands off will go out and win races, but they are risky betting propositions, and you can be assured that I will not bet on them. 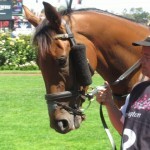 Today Pat Carey’s Durnford put on a fabulous rodeo show all the way around the parade ring and mounting yard. I managed a fairly decent picture! It is no surprise to find that he is another son of that hot-headed horse Helenus. Durnford jumped out of the blocks and led them up at a good pace and only faded over the last two or three hundred metres for an honourable fifth at 30/1. Two more horses with quadruple gear combos. 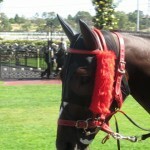 Angola had the tongue tie, cross-over noseband, winkers and nasal strip. I much prefer cleanskins, because the horse must have problems that the trainer is trying to correct. Four problems seem to be more than enough, but it obviously all worked as the horse won as it liked. But I could never back it. Helenus, the sire, was as mad as a cut snake and was forever trying to toss off his nose roll, if not trying to jump over the running rail. It didn’t stop him winning a derby, but I much prefer my stayers to be in the Bart mould – nice and relaxed. No excuses then if they lose. The other one was Olly I Am, with an extremely rare combination of bit lifter, cheekers, ear muffs and winkers. I was intrigued to work out how you could combine a bit lifter with integrated cheekers and I’m still not much the wiser. It kinda looks like a nose band in there but there’s so many straps it’s hard to work out what’s what and how the noseband lifts the bit. But that buckle looks a bit ominous! The horse burst out of the blocks but collapsed in a heap in the straight. A losing day, my first for some time. One winner (Amaethon) and two losers (So Hasty and Taddei Tondo). If I was an each-way punter I would be well ahead. Such is life.